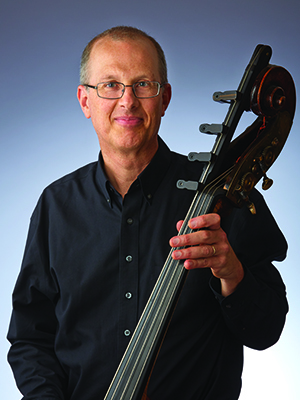 Peter Hansen began playing the bass at the age of 13 after first studying piano, violin and guitar. After completing his education at Northwestern University in 1978 he was an active freelancer in the Chicago area playing both jazz and classical performances. After one-year positions with the Lyric Opera of Chicago, the Grant Park Symphony Orchestra, and the Alabama Symphony Orchestra, Hansen joined the ISO in 1983. Outside of his performances with the Orchestra, he has remained active as a jazz performer and composer, having written pieces for local groups including Outer Bass, the Ronen Chamber Ensemble, the New Century String Quartet and most recently, the Icarus Ensemble, of which he is a founding member. He spent 22 years on the music faculty of the University of Indianapolis as an instructor of bass. He was the recipient of a 2009-2010 Creative Renewal Fellowship from the Arts Council of Indianapolis, which he used to study the traditional music of the British Isles.